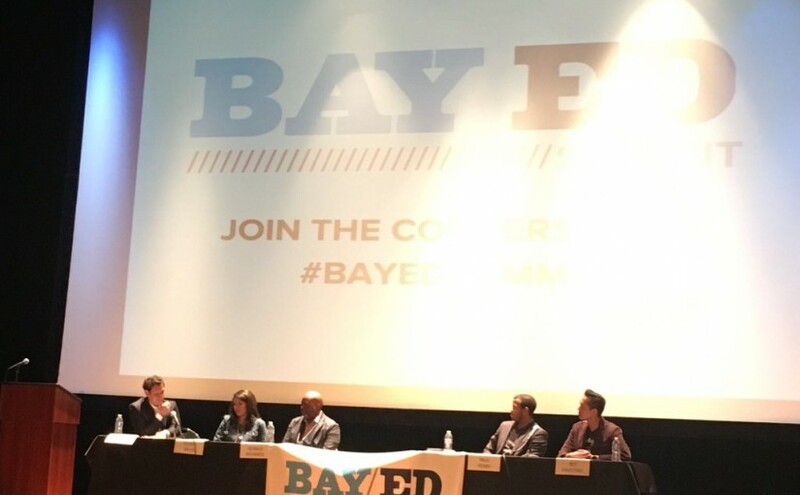 I was invited to speak on a panel at the Bay Ed Summit, a conference organized by Teach for America Bay Area for educators and current and aspiring leaders in the ed world. I realized how I miss the energy of educators! The panel’s topic was “Harnessing our Collective Impact: Game-Changing Insights from Social Innovators.” Daniel Lurie, founder of Tipping Point, one of One Degree‘s funders, moderated the panel, and we were joined by Paul Perry, ED of Reset Foundation, Gerald Richards, CEO of 826 National, and Elissa Salas, CEO of College Track. I spoke about One Degree’s Bay Area expansion into high need areas around the Bay Area (like Contra Costa!) and also our innovative approach to addressing the needs of the whole child. The panel got into policy, measuring impact, and also partnerships. It was a fun event, and it’s always interesting to see what people pick up and talk about on Twitter (#BayEdSummit). Here are some of tweets and grams that highlight the event. Love it! @DanielLurie asks #BayEdSummit panelists for 5-words-of-advice. Example from @1deg‘s @reyfaustino “Our community has agency”. Amen!
. @1Deg founder @reyfaustino says site was built “to support the whole child/family…build your own ‘playlist’ of resources.” Sounds cool! This post was originally featured in the Huffington Post on April 1, 2013. In the late 90’s, I had a friend named Natasha who knew all of the hippest restaurants and the coolest bars. Natasha was the archetypical maven, an expert in the tasteful social scene. Everyone knew you could go to her to get a recommendation for an exquisite date night spot. As we have advanced technologically, we also evolved the way we think about our Natashas, our experts. We needed Natashas in a small town context, when people were concentrated within communities and people identified with each other geographically. Our concept of community has changed. Over the last two decades, technology, democratized information, and crowdsourced data has liberated that paradigm. The way we conceptualize our own “community” is no longer confined to our geographical location. Rather than turning to experts, we turn to Yelp to find a date night spot, and we turn to Wikipedia for the right answer. The power dynamic has shifted, and everyone (with an internet connection) now has the tools to get the information they need because of the onslaught of data. You can be your own expert. However, the social sector seems to be stuck in the internet dark age, 1.0. We still ascribe to the expert power dynamic — where a select few people hold the cards and the keys to the information — particularly when it comes to serving people in low-income communities. We have a good problem on our hands. In some cities across the country, we have an overwhelming abundance of services for low-income families. But why can’t everyone be the expert of these community resources? Navigating the social safety net is notoriously difficult even for professionals like social workers, counselors and case managers. How can we expect people to do this on their own when the current system isn’t even easy or accessible for the professionals? We launched One Degree to shift this paradigm. One Degree is a nonprofit tech company that is building a Yelp-like platform for nonprofit and social services, so that anyone can easily search for critical life-saving services. Consider the story of a grandmother who used the One Degree service last fall. She had been caring for her small grandchildren because her daughter struggled with addiction. After losing custody of her grandchildren to Child Protective Services and finding out she was diagnosed with cancer (treatment for which she was unable to afford), her life was veritably in pieces. She didn’t know where to turn to start finding help. By using One Degree, she was able to connect to an affordable health plan — a small, yet important step that empowered her. Subsequently, using One Degree, she was connected to counsel to begin the process of reuniting her family. Before accessing One Degree, she did not know where to go to find information about these critical resources. The One Degree prototype is just the first step of many that are required to get to Social Sector 2.0 and to truly change the power dynamic in the social sector. It’s our first step to make it easy and accessible for people to find and access services. It’s not enough that we are providing services for low-income families anymore. Families should be able to navigate and share their voice in how these services are run. We imagine a time when people can be their own experts in their own community and experts in what the community has to offer them. And to get to this vision of Social Sector 2.0, we need to join the digital age. We need to streamline data and information about our services. We need to create data systems that work with and talk to other organization’s systems. We need to figure out timely and effective ways to cooperate with fellow social services because families need a lot more than what one organization can provide. And most importantly we need to let go of the antiquated notion that we who work in the social sector know more than the people we serve. That time is quickly coming to an end, and we need to embrace it, evolve, and serve people in the new ways they need to be served. The social sector has a huge opportunity right now to dramatically improve and shift the way we fight poverty in this country — a way that is inclusive of the people and voices in low-income communities and tears down barriers rather than erects new ones. We can make this happen, and in fact the shift to Social Sector 2.0 has already started. To give you a quick update on that, at the retreat we had these activities called Brain Trusts, where we got into small consultation groups and brainstormed a current issue we’re facing. Our topic was One Degree’s vision for growth, and I came away with fascinating insights. It’s a luxury to collaborate with brilliant minds on One Degree’s big picture needs. More importantly it was great to be with kindred socially entrepreneurial spirits. We bonded, shared tips, and also commiserated on the trials of startup life. It’s great to be part of the 2012 Echoing Green cohort! You know how we’ve been talking about this mysterious web platform that’s like a “Yelp for Nonprofits”? Yea, well we actually have one now! It’s a simple version 1.0 of our platform (in “Lean Startup” terminology, this is our MVP, or minimum viable product). We didn’t want to spend a ton of time or money creating a website that we’d have to change anyway, so we’re testing this with the people in our pilot, taking the lessons learned from that pilot and then building off of it in the next round. You can help even if you don’t have web development experience! We need your eyeballs to beta test our site (shouldn’t take more than 30 minutes to an hour and you can do this on your own time next week). Sign up here to help and to get a sneak preview! Can you forward the email below my signature — right now — to one person who may be interested in volunteering? If you’re in the Bay Area, you, too, can sign up to be in our founding cohort of Resource Desk Volunteers! This is a great opportunity to work in schools to connect low-income families to the resources they need to thrive. No experience is necessary to join, and we’re asking for a short time commitment each week. Help us recruit our first cohort of volunteers. Please email your contacts now. The next 50 days are critical to launching our pilot successfully and showing that all families can have easy access to critical services in their community. I hope you can lend a hand. I really think you should check out this new organization, One Degree, which has an innovative solution to fight poverty. They’re looking for volunteers to operate their Resource Desks in low-income schools in San Francisco. I thought this might be a good fit for you. This is a great opportunity to work in schools to connect low-income families to the resources they need to thrive. No experience is necessary to join, and it’s only a short time commitment each week. Check out their website for more info at http://volunteer.1deg.org. Feel free to send this email to your friends, too. One Degree connects kids & families to poverty-fighting resources. We are mobilizing trained volunteers to operate resource desks in low-income public schools. This makes schools the focal point of the community and helps families navigate through the complex web of social services. Furthermore, we’re developing a web and mobile app that’s like a Yelp for nonprofits, which holds all the information about community programs in one place. Imagine millions of people being able to access, rate, review and get information about their local resources, like food banks, employment services and afterschool programs. We hope to make families the drivers of social change. One Degree is a 2012 winner of the Echoing Green Social Entrepreneurship Fellowship. Originally posted on One Degree’s blog. We’ve been a little quiet the last few weeks because now that the organization has settled down in San Francisco, we are busy at work. We could still use skilled hands to help us launch. This month has been tough! It’s been challenging and rewarding all at the same time. I literally hopped from full-time grad student into full-time CEO without a break. A personal thanks goes out to friends Adriana, Lyndsey, Erwin and Coy for housing me this summer! Luckily I found housing starting in August in SF’s Mission District for less than $520/month, which by the way is the cheapest rent I’ve ever had! While the Echoing Green announcement was exciting, it thrust us into the spotlight and turned up the heat. The seed funding is great, but we’ve only raised 30% of our budget this year! Even though there is more work to be done, I’m learning a lot about myself, my own entrepreneurial working style, and my community during this startup phase. Vote for us in the Good Maker Technology Challenge! It only takes two minutes and can land us much-needed seed funding and also great exposure on Good (a news source for all things socially good). Click on the video below to vote! I recently spoke at an event for the All Stars Helping Kids Foundation, which garnered some great connections. Check out the picture below with All Stars Executive Director Kamba Tshionyi, Founder (and fellow Trojan) Ronnie Lott, and Celebrity Chef/Restauranteur Michael Mina. We’ve recently spent time setting up our technology so we’re ready to launch our program in the fall. We’re quietly developing version 1.0 of the One Degree web platform, which is set to be released next month! We’ve got a new home right in the heart of downtown San Francisco! Send your $1,000,000 checks and care packages to One Degree, 144 2nd Street, Lower Level, San Francisco, CA 94105. In-person visits are also welcome! Did you see our recent article on EdSurge, the best edtech news source? If you missed it, check it out here. Also, check out our press release for the Echoing Green announcement (which Yuki kindly put together). I’m off this week to go to the Echoing Green New Fellows Retreat in New Jersey (so excited! ), and as you can see, there’s a lot going on in One Degree world. Stay tuned for my thoughts on the Echoing Green retreat, and thanks for your support! We’re thrilled to tell you that One Degree won the Echoing Green Fellowship! We were one of 20 organizations chosen out of 3,508 applicants to receive this prestigious social entrepreneurship award! I speak for myself and my team when I say that we are humbled and excited by the recognization from Echoing Green. When I got the phone call, I just couldn’t believe it and was deeply moved. The first thing I thought of was the support and energy you all have poured into One Degree. Over the last two years, together, we have planted seeds that are now starting to emerge from the ground. From the first $5,000 we raised together last December to the myriad competitions we entered earlier this year, you have played an important part — whether it was sending positive energy, making a donation or hunkering down and working on the business plan. It took a lot of disciplined, heartfelt work to get to this critical point. The Echoing Green Fellowship propels us forward significantly. Not only does Echoing Green provide seed funding ($80,000), but this competitive award gives One Degree the valuable credibility we need to do our work. With this fellowship also comes immense responsibility. The national spotlight is on us. We have an obligation and the opportunity to see that the One Degree vision becomes a reality. Get the word out. Tell people what One Degree is doing. Tweet the news on your favorite social networks. Feel free to send them this blog post () or the official Echoing Green one (http://ht.ly/boL0z). Join one of our committees. If you can give a couple of hours a week or a set amount of time to help with projects, sign up by email! Connect us to your friends/colleagues in the Bay Area. We’re looking for talented folks, like you, in the Bay to join us! Can you connect us to one person who can help? We’re looking forward to starting this new chapter with your support. Thanks again. What a great start to 2012 it’s been! We recently began to see momentum building after months of laying groundwork. Marshall Ganz, my professor for Organizing, always says, “Energy begets energy,” and the energy surrounding One Degree right now is electrifying! We recently won third place at the Harvard Education Innovation Pitch Competition, which included a lovely $1,500 prize! We also advanced to the semifinal round for the incredibly competitive Echoing Green Fellowship (300+ semifinalists out of 3500+ applicants) AND theUPenn Education Business Plan Competition (only 20% advance). Sadly, we did not advance in the Yale Education Business Plan Competition nor the Harvard Social Enterprise Pitch Competition. Thanks to Karla Monterroso, Rachel Ramos, Deborah Hsieh, and Yuki Kondo-Shah for helping with Echoing Green round 1. Advance thanks to Brett Alessi, Suzanne McKechnie Klahr, Chantal Laurie, and Karla Monterroso for their support on the next round of Echoing Green. We need your help! If you can write/edit essays, record/edit a video, help write our business plan entry for the Harvard Business School Business Plan Competition, let’s talk! We’ve got a ton of work to do! Last month I had an invigorating chat with College Summit Founder J.B. Schramm, and he advised me to “just do it” and get started with implementation. That’s exactly what we intend to do. We’ve evolved our launch strategy with your input to focus on a specific pilot region: San Francisco Bay Area. Our plan is to partner with 10 high-poverty public schools in SF by June to launch our Resource Desks, and we plan to mobilize the community to take ownership of them. I also had another pivotal conversation with Lotus Software Founder Mitch Kapor and Level Playing Field Institute Founder Freada Kapor Klein, in which they highlighted the exciting potential of our proposed web technology (our “Yelp for Social Services”). The implications of building a highly scalable, sector-disrupting technology are huge, and we plan to launch a beta version of this web app by the fall. We see the Resource Desk and Web App working together. The Resource Desk model will be our proof of concept of how to mobilize communities to support schools, while the web app will revolutionize access to nonprofit and social services. Who do you know with technical (as in tech) expertise? We are looking for folks who can create a prototype of our web app. This part of our model is fundamental to the system disruption and community accessibility we want to create. So anyone you could throw our way with a network of tech folks in their life could really help some major shaping of the way we operate! Open up those virtual Rolodexes and let us know who we can charm into being a champion. Email us with your recommendations! Thanks for all of your continued support and energy! We competed on Thursday, February 2, 2012 at the Harvard Education Innovation Pitch Competition, and placed third — behind two very education-focused organization, whereas ours really disrupts the traditional education system. Not bad for our first competition ever! Additionally, out of 3,508 applicants for the prestigious social entrepreneurship fellowship, Echoing Green, our startup is among the roughly 350 that advanced to the semifinal round. We need to submit a second round of application materials by February 21, and we hope to make it to the final round to eventually become an EG fellow! EG Fellows receive $80,000 per year for two years to start their concept. In other great news, we also became semifinalists for the University of Pennsylvania Education Business Plan Competition. An executive summary and 20-page slide deck are due on March 16, and again, we hope to become finalists for this competition as well. We are eligible for four categories, the UPenn-Milken prize, the Startl Prize, the Educational Services of America Prize, and the Erudient Borderless Education Prize. The top prizes are in the $25,000 and $10,000 range. More importantly, if you can help edit/write essays, record/edit video, or send positive support, please let us know in the comments below! You can still donate to launch Connective Possibilities! Our official fundraising campaign through StartSomeGood.com is technically over, and you can visit our fundraising page here, but that doesn’t mean that the fundraising stops! In fact, this is just the beginning. You can still support us by making a donation today! Click on the button below or this link to help us launch our organization. I’ll also update you all soon with some fascinating data from our first 50 days of fundraising. Posted on December 2, 2011 Categories harvard kennedy school, Leadership, NonprofitTags fundraising, socentLeave a comment on You can still donate to launch Connective Possibilities! Education Pioneers is a national nonprofit organization that “identifies, trains, connects, and inspires a new generation of leaders dedicated to transforming our educational system so that all students receive a quality education.” Fellows are placed in educational organizations for a 10-week high impact project during the summer between their graduate school years. The Highland Street Foundation is a small family foundation based in Newton, MA, which is a suburb of Boston. The foundation boasts a $190 million endowment and funds education, youth, mentoring, health care, and cultural institutions in Massachusetts and California. When I was placed with the Highland Street Foundation in May, I was slightly concerned because I didn’t know if I would be able to connect with the grant-making side of the nonprofit world. For over a decade, my worldview and context has been shaped by grant-seeking organizations. Yet here I am spending 10 weeks with the good folks at Highland Street, and thus far the experience has been eye-opening. 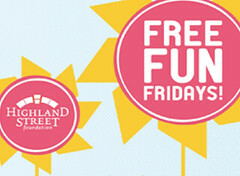 My project this summer is to do an evaluation of one of the foundation’s grant programs, Free Fun Fridays. The Free Fun Fridays program opens up the doors of over 20 of Massachusetts’ most famous cultural institutions for free this summer. Highland Street will underwrite all of the admissions costs of the cultural institutions. This is the third year that the foundation has implemented Free Fun Fridays, and this year they were interested to learn about the economic and social impact of the program — what is the economic impact on museums, neighboring businesses and families? The interesting thing is that the foundation doesn’t have a history of doing evaluations or assessments of their grant programs (other than a post-grant report that grantees must submit). I’m literally starting from scratch and have called on my professors and friends who are experts in the field of program evaluation to lend me their expertise. I’ve also noticed that being on the grant-making side of the table provides a completely different angle, and I feel a shift in the power dynamic. I accompanied my executive director on a site visit to one of our grantees. The grantees (who will not be named) included over 20 bigwigs from their organization to the meeting, and I thought they would overtake the meeting since we were significantly outnumbered. Instead, however, my ED ran the show sharply and with such certitude and ownership. He threw out questions quickly, and the grantees’ staff tried to answer as adeptly and succinctly as possible. You could feel the power hovering strongly over the Highland Street side of the room. It was an absolutely new feeling to know that you were on the side of the room that held all of the chip, while the other side of the room wanted those very chips. To their credit, they didn’t exude any overt desperation. I did, however, sense that the balance of power was definitely on the corner that held the potential to give them another $1 million grant. Since I’ll be in the belly of the philanthropic beast this summer, I hope to learn about what truly makes philanthropy work and how to build relationships with decision-makers at foundations. So far, my assumptions have been challenged, and I’m looking forward to sharing more of what I learn as the summer progresses.